“For as long as I can remember, I always dreamed of becoming a pilot, but born with cerebral palsy, this dream seemed to be completely unreachable, especially in a country like Germany, where you already lose your place in the society when diagnosed with a disability. Going to a public school, to university, finding a job, getting a driver’s license or just living a normal life are almost unreachable goals. So becoming a pilot ... NO WAY. Against all odds I went to a public high school (as the only disabled student at the entire school), followed by studying aeronautical and automotive engineering at the Munich University of Applied Sciences. Unable to fly an aircraft, I wanted to work on them at least. But although I finished university with a really good degree, I haven’t been given the chance to prove my skills and knowledge in an aviation related role. Sadly this achievement now turned out to feel been just a big waste of time and effort. In 2016, I came to Britain in order to gain my pilot’s license at Aerobility. And everything became a completely different story. I felt to be welcome and accepted everywhere I went in Britain. I rented a room in a shared flat and was able to live a normal life for the first time, without prejudices everywhere around me. And I had a goal again: making my biggest dream come true and becoming a pilot. Nobody told me anymore that I can’t fly an aircraft when not proved otherwise. It was completely up to me to demonstrate, that I can do it. And everybody at Aerobility gave me every support they could give to get me there. Learning to fly became more and more complex during the course. So I had to push my physical limits a bit further almost every day. Improving my motor skills and my speech was necessary to fulfil the requirements, and it is also very useful in my everyday life. After seven months of flight training in total my biggest dream turned into reality: I passed the skills test and became a private pilot without a single limitation. Looking retrospectively on the last 42 years, this was my only true achievement so far and this seven months in Britain were the best days of my life. And the PPL made it possible for me to be completely accepted as an equal person in Germany for the first time in my life by a group of people. 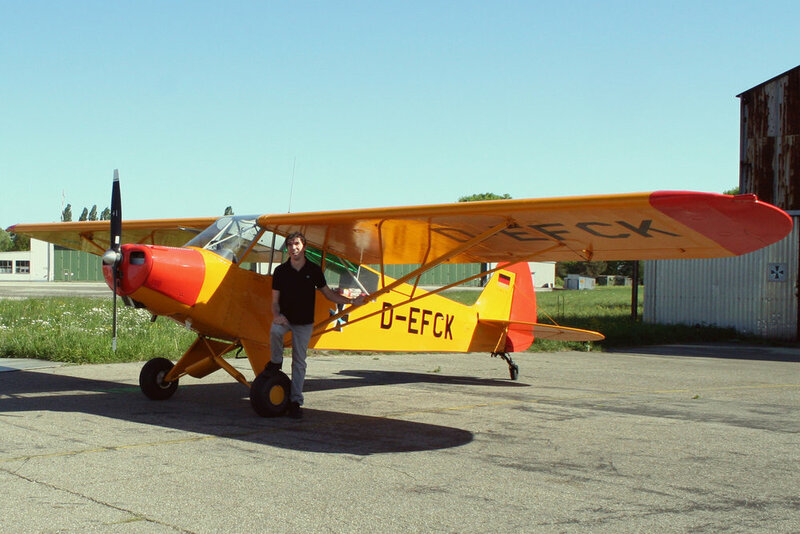 And that’s at our local flying club in Erding, where I became a member. It still feels a bit like being in Britain where I also experienced this natural acceptance everywhere. In the beginning, some of the members were a bit sceptical if I can really fly and should become a member, but thanks to Aerobility’s incredible flight training, my flying skills are so good that everyone was amazed by the way I’m able to fly our club’s aircraft and they trust me so much that I became one of the club’s airfield supervisors and radio operators. Since the military operations have been discontinued on our airfield in 2014, we are responsible for the air traffic on our own. Flying is still the only bright spot in my life, and with every foot I climb into skies all the trouble and disappointments seem to fade away. Especially I like to fly into the alps between and above huge mountains, having lunch at small Austrian airfields. It’s always wonderful to see this beautiful part of the world from high above with the different faces of the seasons. Also, spending time with my friends at the flying club is always great fun and gives me a place in Germany where I belong. This year I went on with night flying at Aerobility. One more thing I dreamed of for a lifetime. Being up in the almost dark sky with thousands of lights underneath and the moon over the wing with some clouds around. Seeing the aircraft’s lights on the wing tips, like back in time when I was a child, looking out of an airliner’s window and dreaming of becoming a pilot. And everything is so incredible peaceful, followed by this awesome picture of bright airport lights and a runway lit up like a huge Christmas tree. And I started with aerobatic flying at Blackbushe, an experience that tops it all. Doing spins, rolls and loops give me the feeling of a totally unlimited but fully controlled three dimensional movement ability. A fantastic feeling, when your own body movements are a bit limited and not really well controlled. Aerobatic flying is definitely the next big goal in my flying career. Of course, I’m still dreaming of flying commercially. Even just flying as a first officer on a tiny business jet would be the ultimate achievement for me. The shame is, physically I could do it for sure. But who would hire me, with my appearance of a handicapped person? And with this uncertainty I’m not willing to waste a lot of money again, like I did with my university studies. Perhaps gaining my PPL in Britain with Aerobility will be the only achievement of my life forever, but in the end it was the fulfilment of my biggest dream and gave me the ability to live a life full of joy and happiness for seven months.